The 2012 American Eagle Platinum Proof Coin is struck for collectors from one ounce of .9995 platinum. Each coin marks the continuation of the Platinum Eagle Program dating back to 1997 as well as the fourth year in a series containing special annually changing reverses dedicated to the principles found in the Preamble of the Constitution of the United States. The reverse for 2012 will feature a them based on the principle of "To Provide for the Common Defence." The Platinum Eagle Program itself debuted with four different sized Eagles - one ounce, 1/2 ounce, 1/4 once and 1/10 ounce. However, the fractional sizes were discontinued in late 2008. 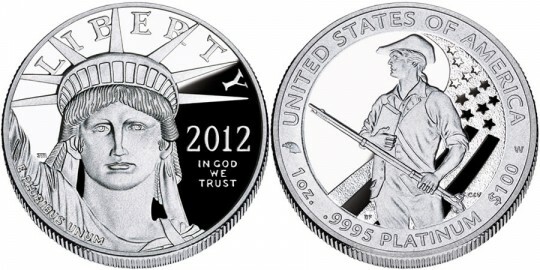 Shown on the obverse is a depiction of the Statue of Liberty looking "towards the future" as designed by US Mint Sculptor / Engraver John Mercanti. Also shown are the inscriptions "Liberty," "E Pluribus Unum" and the year of mintage. The reverse will contain an image based on the theme of "To Provide for the Common Defence" and also include the inscriptions of "United States of America," " 1 oz," ".9995 Platinum" and "$100." It was designed by United States Mint Artistic Infusion Program Associate Designer Barbara Fox and sculpted by United States Mint Sculptor-Engraver Charles L. Vickers. It depicts a vigilant minuteman from the Revolutionary War.